Tragedy and irony surround the evolution, success, and cancellation of Alias Smith and Jones, the breezy Western-comedy that ran on ABC from 1971 to 1973. Producer Roy Huggins initially came up with the idea for a TV series loosely inspired by 1969’s Butch Cassidy and the Sundance Kid. That’s no surprise since Huggins pretty much invented television’s Western-comedy genre when he introduced Maverick in 1958. For his new series, Huggins envisioned a lighthearted show about two young men—one straight and narrow and the other a hustler—who travel the Old West together. Roger Davis in The Young Country. That concept came to fruition as The Young Country, a 1970 made-for-TV movie that doubled as the pilot for a new series. It starred Roger Davis as Stephen Foster Moody, an honest young man, and Pete Duel as Honest John Smith…who was the dishonest one. The female lead was played by Joan Hackett, who co-starred in the previous year’s Support Your Local Sheriff. That theatrical film headlined James Garner in a role very similar to Bret Maverick. If you think that’s a coincidence, well, we’re just getting started. In The Young Country, Stephen Foster Moody comes into possession of a large stash of money when he comes to the aid of a meek businessman (Wally Cox), who is killed. He subsequently tries to find the dead man’s family so he can give them the money. In reality, the loot was embezzled as part of a con masterminded by Clementine Hale (Hackett) and Honest John. The Young Country is a pleasant but slight movie and--not surprisingly--ABC passed on the weekly TV series. A year later, Glen A. Larson, who had worked closely with Huggins in the television industry, made Alias Smith and Jones. Like The High Country, it was a lighthearted Western and again starred Pete Duel. This time, he was paired with newcomer Ben Murphy as a couple of outlaws trying to earn their amnesty. 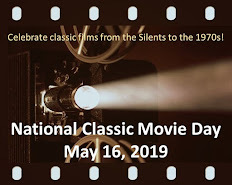 There were numerous similarities to Butch Cassidy and the Sundance Kid: the playful banter between the friends; the tongue-in-cheek tone; Ben Murphy’s resemblance to Paul Newman; and even the names of their gangs (Hole in the Wall Gang and Devil’s Hole Gang). According to producer Jo Swerling, Jr., quoted in Paul Green’s book Roy Huggins, 20th Century-Fox unsuccessfully sued Universal over those similarities. 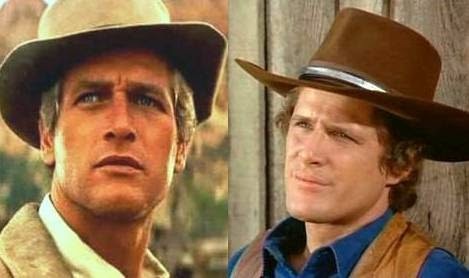 Paul Newman and Ben Murphy: Do you think they look alike? 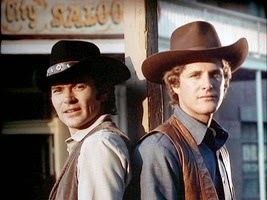 The Alias Smith and Jones telefilm starts with Hannibal Heyes (Duel) and Kid Currie (Murphy) having a bad day. After successfully robbing the passengers on a train, they can’t get the safe—their primary target—opened. After observing their frustration, an elderly lady (Jeanette Nolan) politely suggests they get out of the outlaw business. She gives them a handbill about how lawbreakers, under certain circumstances, can gain amnesty from the governor. Eventually, Heyes and Currie decide to pursue that amnesty. However, the governor decides not to grant it outright to two such notorious outlaws. His deal is that they must stay out of trouble and not break the law until they “earned” amnesty. That turns out to be a tough challenge when Heyes winds up working as a bank teller…in the very bank that his former gang plans to rob. With a running time of 74 minutes, the Alias Smith and Jones pilot movie loses steam before its conclusion. Still, the two leads are engaging, especially Duel who lights up the screen as a good guy with a twinkle of larceny. ABC gave the TV series the greenlight and it debuted in January 1971. While never a big hit in the ratings, the regular series attracted a faithful following. Many of the best episodes featured recurring guest stars Sally Field and J.D. Cannon. 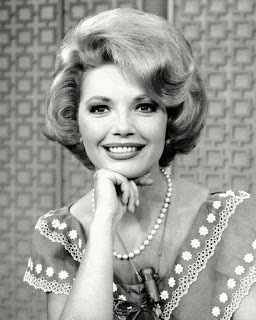 Field played Clementine Hale (yes, that character is from The Young Country), a childhood friend of Heyes and Currie, in two first-rate episodes. J. D. Cannon was even better as a bumbling Pinkerton detective named Harry Briscoe in five episodes. 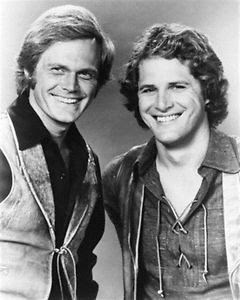 Roger Davis and Ben Murphy. As Alias Smith and Jones celebrated its first year on the air, tragedy struck on New Year’s Eve 1971. Pete Duel fatally shot himself in his Hollywood home. With the show in mid-production, the role of Hannibal Heyes had to be recast quickly. The part went to Roger Davis, who—in addition to his Young Country connection—had narrated the show’s opening each week. I can’t imagine a better replacement than Davis, who slipped into the role effortlessly. Yet, while he and Murphy still had chemistry as Heyes and Currie, the shadow of Duel’s death hung over the series. Still, it was attracting a respectable viewing audience when ABC canceled it after the third season. By then, Roger Davis had appeared in 17 episodes as Heyes (compared to 33 by Duel). Of course, the Western genre was also fading on television. Occasional Westerns would continue to pop up on TV, but the days of dominance were long gone. Even long-running stalwarts Gunsmoke and Bonanza had headed to Boot Hill by 1975. I remember the show well and now own the complete series on dvd. Growing up, I remember many times Ben Murphy would return home visiting his family. Ben would often stop in his mom's local dress shop where he would sign autographs and visit with the locals. No fanfare just a friendly down to earth guy visiting local fans. Universal didn't allow the cast a mourning period - had a schedule to maintain. Glen Larson had so many shows "inspired" by movies that he'd earned the nickname "Glen Larceny". I remember watching this show faithfully, along with The Guns of Will Sonnett, Lancer, and Bearcats around this time. 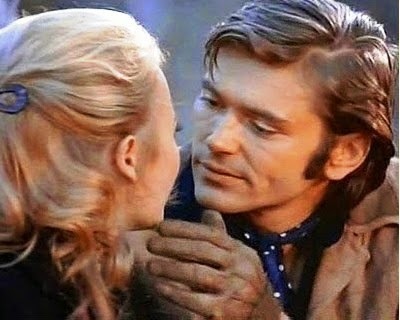 I really liked the talented Pete Duel, and thought the show was not the same without him. Pete Duel was disillusioned by spending another decade in television when he wanted to be a movie star and thought he was worthy of roles given to some of his contemporaries, whatever the opinion you have of him, you have to admit,he certainly had star quality and was arguably the most handsome and charming actor to have graced the small screen. Bless him. I remember Ben Murphy from episodes of Murder, She Wrote and Dr. Quinn, Medicine Woman. Also the TV movie Gidget Summer Reunion with Caryn Richman.